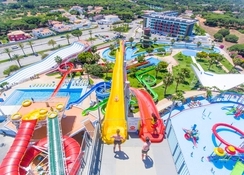 In the sunny Vilamoura resort of Portugal, the Aquashow Park Hotel is a 4-star family-friendly property that houses a fun-filled water and thematic park. Loaded with all the facilities ensuring a comfortable stay, the hotel is located within the premises of the Aquashow Park. It is also close to the beach and offers a range of water sport activities for the guests to indulge in. Comfortable and airy 148 guestrooms, multi-cuisine restaurants and a touch of luxurious hospitality is what makes the Aquashow Park Hotel Portugal a top tourist favourite in coastal Algarve. There are attractions outside the hotel grounds too: take a bus from the hotel to the Beach of Quarteira, the marina of Vilamoura, or the nearby Albufeira! A perfect base for a lovely beach holiday on the sun-kissed Algarve coast, the hotel has an array of amenities on offer, which includes a heated indoor pool, Jacuzzi, outdoor swimming pool for adults and kids, playground and a fully-equipped gym. The Aquashow Park Hotel is located at the Quateira area in Portugal’s Vilamoura. The fine Blue Flag beach of Quarteira is only five minutes’ drive away. There is a charming fishing village in the nearby Albufeira, complete with cobblestone streets and small churches. Cars and bikes are available for rent at the hotel. The nearby airport, Faro, is 30 km away. 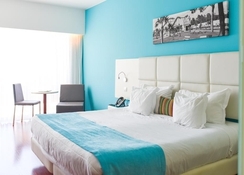 There are 148 modern, well-furnished rooms in the Aquashow Park Hotel. The rooms are tastefully furnished and come with balcony, two spacious individual beds, air conditioning, private bathroom (walk-in shower, hair dryer, bath amenities, make-up mirror), mini bar, desk, LCD TV, internet (chargeable), safe and telephone. Twin rooms can accommodate up to 2 people, twin plus up to 3 and family rooms up to 5. The hotel has both bed and breakfast and half board options. The main buffet restaurant Charme has a varied menu Portuguese delights served at buffets as well as a la carte. The Requinte lobby bar and Sensação pool bar offer refreshing cocktails and mocktails. 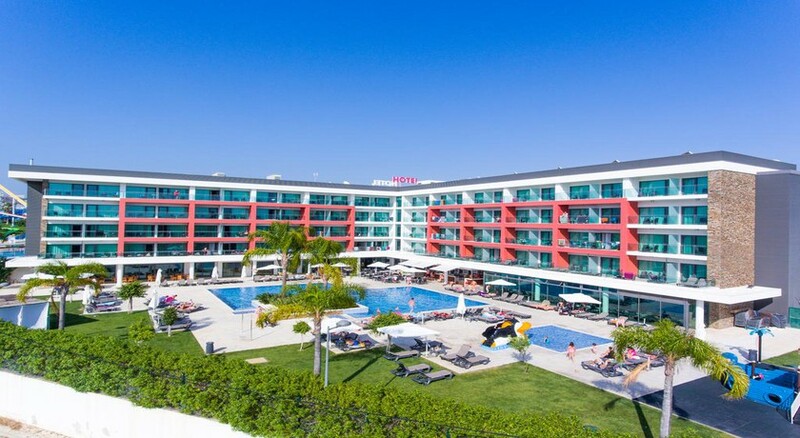 Aquashow Park Hotel Portugal has an outdoor swimming pool, with sun loungers as well as a heated indoor pool, which offers a Jacuzzi and massage rooms (with charge). Health enthusiasts can check out the fully equipped gym with fitness and cardio machines. For kids aged 3 to 11 years, there is a Kids’ Club to keep them engaged. 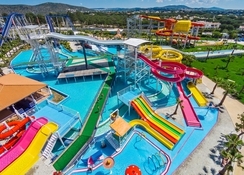 The Aquashow Water Park admits hotel guests for free and offers exciting slides and themed rides. Vilamoura has an excellent golf course and guests can also enjoy a number of sports facilities near the hotel, including tennis, fishing, boat rental and sightseeing cruises, horse riding, surfing and windsurfing. You can also enjoy a relaxing fish spa or body massage at the hotel’s spa. 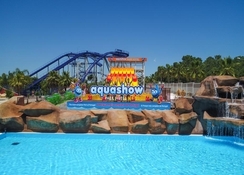 > Free Entrance to Outdoor Aquashow Park from 01 May to 30 September. > Indoor water Park Access: extra charge locally. If the occupancy is low, the Hotel won't have buffet, it will be SET MENU (from Hotel's selection): 1 soup + 1 entrance + 1 meat dish + 1 fish dish + 1 dessert. Please Note : The Hotel doesn’t held responsability if the gymnasium or jacuzzi is out of order during the stay. !